First off…we would want to wish you all a very Happy Thanksgiving. With lines around the corner and chaotic shopping experiences, we often forget what this holiday is supposed to be about. No it’s NOT turkey and overeating. It’s about being thankful for what we have. Here at Good Breeze we are extremely thankful for our customers, friends and all the support we have received over the years. It is because of all of you that have made it possible for us to grow and continue to spread the stoke. We are going to do our best to give that love back this weekend with our Black Friday deals. Below are a couple of the items we will be highlighting. Make sure to browse throughout the site. We will be discounting and updating items randomly as well. SMALL BUSINESS SATURDAY! We take pride in being a small business. We want to try and offer our local and regular customers the best deals we can. So if you come in on Saturday, we will do our best to give you a crazy deal. We want to support those who support us! ***NOTE: THERE WILL BE TONS OF OTHER DEALS WE CAN’T LIST HERE. DON’T FORGET TO CHECK US OUT! Complete Slingshot Refraction board with Dually Straps for $335! We’ve already been offering 25% off these. For a limited time only we will take an additional $100 off. Limited quantities! We made a deal with Slingshot and purchased all the boards they had left with small cosmetic “blemishes”. These boards have no compromise structurally and carry the same warranty as an other board. Each board has slightly different blemishes. Sometimes you can’t even find them! 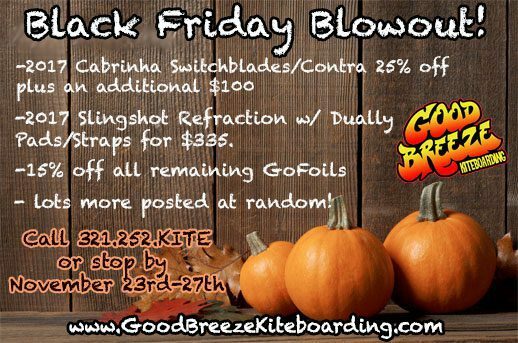 We will be offering these boards at incredible discounts Thursday through Monday. Don’t miss out!